I know that Valentine’s day is not cherished by all. It can be a hard holiday. I also know that, these days, it is a guilted holiday for many who feel obligated to buy up enough of the cliche goods and put out enough money to make sure a fellow loved one feels they are in a treasured spot. It’s not about $$. Hate to break it to those folks. Me? Want to know what I want most from MY sweetie, my “Valentine”? Just some time. Maybe a stolen nap during the day while the kids are at school, I’d love that. All curled up under a fuzzy throw, his arms around me as I lazily do no chores and just soak in the blessing that is just HIM having been my husband for 15 years now. It’s enough. I do that on lazy Sunday afternoons and it’s honestly one of my most favorite and treasured times of the whole week. I LOVE Valentine’s Day. 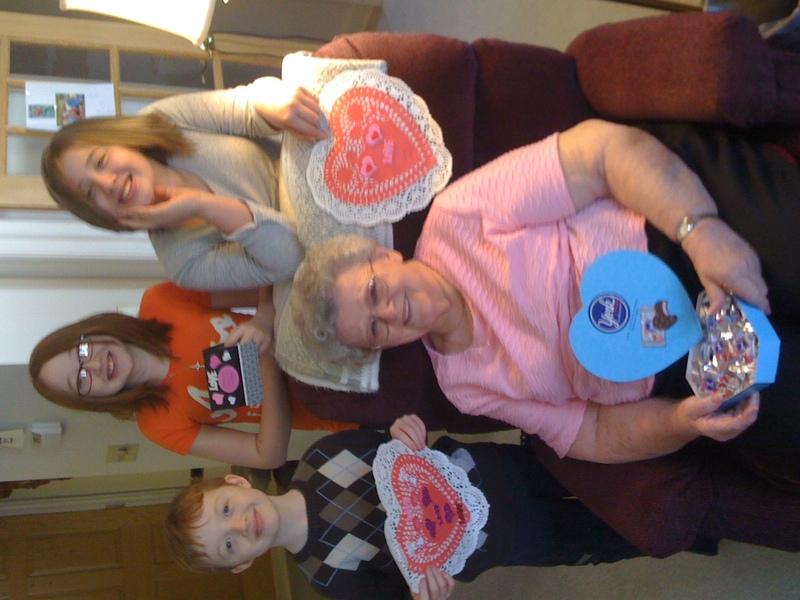 I love those crayon hearts and doily cut outs. It makes my heart sing to see the joy on my kid’s faces when they show off their creations that express what someone means to them. Case in point? This is my grandma. She’s super special, and I have a cherished relationship where I get to go each Wednesday and have lunch with her and curl up in the living room and we chat while we watch some insane home makeovers on HGTV before I head back home to my kiddos. There’s no card that says how much all that means to me. There’s no way to truly purchase something to tell her that… so we made a surprised visit today to see her and bring her a hug from her Great Grandkids and some homemade love gifts. Happy Valentines Day – and may you feel loved simply because you ARE!